have many drug identification to choose from. 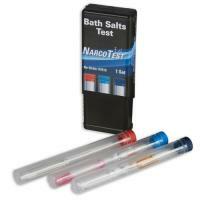 Forensics Source has developed a presumptive test kit to detect the components of Bath Salts while in the field. This novel kit combines Scott's and Marquis Reagents with a sodium nitroprusside reagent kit. Each cost-effective, portable kit contains a single-use, three stick test for accuracy. This three-trial kit offers improved, more scientific results than a single test given that a single positive result can be inconclusive when it comes to Bath Salts. The plastic packaging can be utilized to quickly and easily dispose of used reagents. These small-form testing kits are great to take into the field and on the scene of a forensic investigation.